Thank you for tuning in to our Write Right screencasts. Today we will be discussing the grammar rule of contractions. • A contraction occurs when you combine two words into one. A few letters will be replaced by an apostrophe. For example, take the contraction I’m. • The use of contractions can make a thought or command more streamlined and concise. When should contractions be used? It’s always a good idea to consider your target audience. • It is most common to use contractions in informal or casual writing (as well as speaking). • However, in academic and more formal writing, the use of contractions is not encouraged. How do we form contractions? Take the one we first looked at: I am becomes I’m. And there are many other contractions! One thing to be mindful of while forming contractions is: homonyms. What are homonyms? Homonyms are two words that sound the same but do not share the same meaning. Sometimes contractions can be tricky because the word that is formed sounds similar to another word. But it sounds a lot like the possessive pronoun your. Rather than “Your friend is in my class,” where your is a possessive pronoun. But this one is tricky because “they’re” sounds like “their,” the possessive pronoun and “there,” the preposition. “My class is over there,” where “there” is a preposition. Remember: The contraction “it’s” contains an apostrophe, where the possessive pronoun “its” does not. 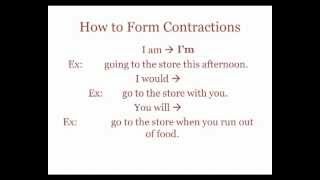 So, I hope this has been a helpful guide for forming and using contractions. Thanks again for tuning in to our Write Right screencasts.